Eelsalu M., Männikus R., Pindsoo K., Soomere T. In search for management options for shores of the City of Tallinn, Estonia (13.06). Pindsoo K., Eelsalu M., Soomere T. On the proper choice of tools for the projections of extreme water levels in the Baltic Sea (14.06). Kussembayeva K., Kudryavtseva N., Soomere T. Transfer of techniques developed for the Baltic Sea to the Caspian Sea region: Decadal wave climate variability of the Caspian Sea from satellite altimetry (13.06). Najafzadeh F., Kudryavtseva N., Soomere T. Application of empirical orthogonal functions reveals multiple modes of variations in the Baltic Sea wave climate (14.06). The newspaper Pealinn (The Capital City) published a short comment on the possible dangers to Tallinn related to climate changes, Pealinn, 19(600), 11.06.2018, 8. Kudryavtseva N., Pindsoo K., Soomere T. Non-stationary modeling of extremes in water levels along the Baltic Sea coast. Eelsalu M., Pindsoo K., Soomere T., Julge K. Interannual coastal processes in Estonia, Peraküla beach monitored by laser scanning technology. Giudici A., Kalda J., Soomere T. Modeling patchiness on the sea surface caused by the interplay of winds and currents in the Gulf of Finland. Männikus R., Soomere T., Kudryavtseva N. On the water level measurements in the Gulf of Riga during 1961–2016. (solicited paper) Parnell K. Building natural morphologies for effective beach nourishment. T.Soomere participated in the 11th meeting of the Baltic Earth Science Steering Committee (Helsingör, Denmark). T.Soomere presented the paper Kliimamuutuste teravad jäljed merelinnades (Signatures of climate change in coastal cities) to the joint conference of Estonian and Finnish muncipal engineering societies “Kvaliteetse elukeskkonna võimekad loojad” (Creating high-quality living environment) (Tallinn, the Russian theatre). T.Soomere participated in the award ceremony of the L’Oreal-UNESCO prize for female scientists (Riga, Latvian Academy of Sciences). T.Soomere participated in the European Academies Science Advisory Council (EASAC) council meeting (Vienna, Austrian Academy of Sciences (Sofia, Bulgarian Academy of Sciences). Kudryavtseva N., Pindsoo K., Soomere T. Non-stationary modeling of trends reveals spatial patterns of variations in extreme water level changes along the Baltic Sea coast (28.05). The visit of T.Soomere to al-Farabi Kazakh National University focused on preparation of a new curriculum in mechanics for international students. T.Soomere was moderator of the panel discussion on the conference of Estonian centers of excellence in science (Omicum, Tartu). T.Soomere presented the paper Kliimamuutused: teadus poliitikat toetamas (Climate change: science supporting policy) to the climate conference “Meie tee Pariisi” (Our road to Paris) of the Ministry of the Environment and participated in the panel discussion of this conference (Tallinn, the House of Ministries). T.Soomere participated in the General Assembly of the union All Europan Academies ALLEA and presented a final comment to the conference „Science in Times of Challenged Trust and Expertise: Shaping European Science Advice“. (Sofia, Bulgarian Academy of Sciences). T.Soomere received the Medal of the Coat of Arms of the City of Tallinn for his long-term contribution to marine and coastal studies for the benefit of the city and its inhabitants. Delpeche-Ellmann, N., Soomere, T. Possible presence of shear instabilities at steep slopes during an upwelling event in the Gulf of Finland, Baltic Sea. Kudryavtseva, N., Pindsoo, K., Soomere, T. Non-stationary modeling of trends in extreme water level changes along the Baltic Sea coast. Giudici, A., Kalda, J., Soomere, T. Joint impact of currents and winds on the patch formation near the coasts of the Gulf of Finland. Kelpšaitė-Rimkienė, L., Soomere, T., Bagdanavičiūtė, I., Nesteckitė, L., Žalys, M. 2018. Measurements of long waves in Port of Klaipėda, Lithuania. A longer interview with T.Soomere in the broadcast Osoon of the national TV channel ETV about functioning our beaches under climate change. T.Soomere was inaugurated as honorary doctor of Klaipeda University (Lithuania). A part of the event was the public academic lecture Multifaceted patterns of climate change in the eastern Baltic Sea. T.Soomere participated in the joint meeting of EASAC (European Academies Science Advisory Council) environment steering panel and energy steering panel (Budapest, Hungarian Academy of Sciences). T.Soomere presented the paperReflections of climate change in nearshore and coastal processes in the Baltic Sea o the colloquium Future of coastal dynamics research on the occasion of the 75th birthday of Prof. Dr. Jan Harff, Ernst Moritz Arndt Unversität Greifswald, Germany. T.Soomere participated in the meeting of the network “Growth and innovation in the ocean economy: Baltic Sea Checkpoint. Sebastian Checkpoints – Lot 3 Baltic” of the call MARE/2014/09 (Danish Meteorological Institute, Copenhagen, Denmark). T.Soomere participated in the meeting of the steering committee of the Baltic Sea Science Congress 2019, Stockolm, Sweden. N.Delpeche-Ellmann participated at the European Geosciences Union General Assembly (Vienna, Austria, 8–13 April 2018) with the oral presentation: Delpeche-Ellmann N., Döös, K., Viikmäe, B., Soomere T. Examining the role of bottom topography on coastal upwelling jets using a synergy of in-situ, satellite and model data in the Gulf of Finland, Baltic Sea (EGU2018-15364). T.Soomere presented the lecture Kliimamuutuste kauge kõmin Eestit puudutamas (Remote echo of climate change will touch Estonia) to the conference of employers “Tuulelohe lend” (Swissotel, Tallinn). A longer comment by T.Soomere to the broadcast Ringvaade of the national TV channel ETV about the background and possible solutions of the problems related to disruptions of ferry traffic to Hiiumaa because of low water level. T.Soomere presented the lecture Kliimamuutuste peegeldused Eesti rannikuvetes (Reflections of climate change in Estonian coastal waters) to the Biosphere Day, Kuressaare, Saaremaa. T.Soomere presented the lecture Statistika ja dünaamika sümbioos mere- ja rannikuteaduses (Symbiosis of statistics and dynamics in marine and coastal science) to the 29th conference of the Estonian Statistical Society “Andmeteadus eluteaduste teenistuses” (Data science serves the life sciences, Narva College, of the University of Tartu, 23.–24.03.2018) . T.Soomere presented the lecture Kliimamuutuste nähtamatud mõjud ja riskid (Invisible impacts and risks of climate change) to the 13th conference “Põllumees kui tippjuht 2018″ (Farmers as top level leaders), Olustvere. A short comment of T.Soomere about presentations to the lunch of opinion leaders organised by the daily newspaper Postimees. T.Soomere presented the lecture Unistused, ootused ja faktid kiiresti muutuvas maailmas (Dreams, expectations and facts in the rapidly changing world) to the team of developers of the new version of national curricula for the gymnasium level, Tartu, VSpa conference centre. T.Soomere presented the opening lecture Pöörates mereäärset riiki näoga mere poole (It is time for the coastal country to face the sea) to the conference “Eesti mereteadus 2018” (Estonian Marine Science 2018), Aula of the University of Tartu. A short comment of T.Soomere about certain specific marine noise heard near Laimjala, Saaremaa (Saarte Hääl, 15. märts 2018, p 4). https://www.saartehaal.ee/2018/03/15/kulalood-laimjala-rahvas-jai-ilma-ebamaise-kolaga-meremuhast/. T.Soomere participated in the live-on-air broadcast Suud puhtaks (Hard-talk) dedicated to the problems related to the planned wood chemistry plant in Tartu county. A comment by T.Soomere to the broadcast Aktuaalne Kaamera of the national TV channel ETV about the recommendation of the Research and Development Council about the recommended level of investments into research. 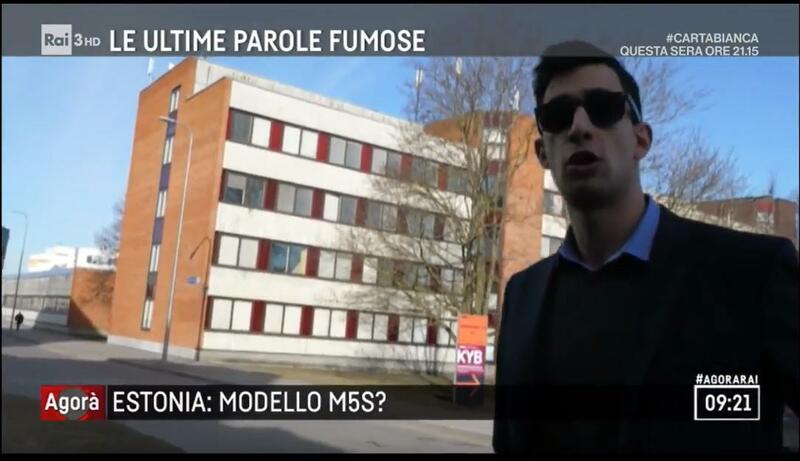 A longer comment by T.Soomere to the broadcast Seitsmesed uudised (News at 19.00) of the TV channel TV3 about problems related to the planned wood chemistry plant in Tartu county. A comment by T.Soomere to the broadcast Aktuaalne Kaamera of the national TV channel ETV about the reasons behind unusually low water level in the Western Estonian archipelago. An article by Laura Mallene reflects a longer interview with T. Soomere about mechanisms how the choices of parents steer the thinking of children [Laura Mallene, Tarmo Soomere: laste kasvatamise mõju avaldub vanemate valikute kaudu. Eesti Päevaleht (Estonian Daily), 33, 16.02.2018, 6]. T.Soomere presented the lecture “Richness in forest and mineral resources: dreams and obstacles” to the joint winter conference of the Estonian Society of Biology Teachers and Estonian Union of Chemistry Teachers (Tartu, Omicum, 16.–17.02.2018). An interview with T. Soomere published in the February issue of popular science magazine Eesti Loodus (Estonian Nature) invites scientists to be more active in various kinds of social media (Rainer Kerge. Teadlased peavad okupeerima Facebooki! (Scientists must occupy Facebook!). Eesti Loodus, 2/2018, 44–49). A paper by Küllike Rooväli “Veetaseme oodatav langus esialgu praame ei ähvarda” (A drop in water level is not yet dangerous for ferry connections) based on comments of T. Soomere about possible magnitude of low water level in an unusual south-eastern storm, Õhtuleht, 17.01.2018. A longer interview with T. Soomere in the broadcast Kajalood of the national radio channel Vikerraadio about current changes in the air flow and associated changes in our weather, and about problems faced by young scientists in Estonia. A live-on-air interview with T. Soomere in the broadcast Terevisioon of the national TV channel ETV about legacy of the 2005 January storm, achievements of operational oceanography in Estonia and about implementation of the new (Amsterdam) height system instead of the classic Kronstadt-zero-based system.